The devices market is plateauing, China’s economy is slowing, Indian consumers are more interested with other brands, iPhone sales are down, as is revenue and operating income, expenses are up. It doesn’t exactly paint a picture of serenity and profitability, but share price increased more than 5% in overnight trading. CEO Tim Cook and his team did manage the situation quite effectively with a recent profit warning and have seemingly tabled a plan which has caught the interest of investors but let’s just put this overnight surge into perspective. The last couple of months have not been good for Apple. At the beginning of September, Apple share price was hovering around the $228 mark, while at the time of writing, it has declined more than 30% to $154. Cook should be nervous. “Last night’s results beg the question, are investors falling out of love with Apple?” said Christopher Dembik, Head of Macro Analysis at Saxo Bank. Overall revenues were down to $84.3 billion, 5% lower than the same period in 2017, though it was in-line with the revised forecast from a few weeks back. For the next quarter, revenue is expected between $55 billion and $59 billion, with a gross margin between 37-38%. Looking at the results, the iPhone weighed Apple down heavily. Shipment numbers will no-longer be released by the team, though revenues for the cornerstone product declined an almost inconceivable $9.1 billion, a 15% year-on-year drop, to $51.982 billion. This is still a huge amount of cash, but such a dramatic decline indicates someone got something very wrong somewhere. The last couple of months of 2018 were a scrap for Apple to justify the pricing of its flagship devices. Cook and his cronies seem to have accepted what many people were telling them; the devices have become too expensive. Moving forward, the team seem to have indicated there will be price reductions. This is what Apple have specialised in over the last few decades; customer loyalty and sweating the brand. There aren’t many cults out there who can count on their followers as loyally as Apple can count on the iLifers, but when the company was innovating they could justify marking a premium on products and rely on the Apple followers to make purchases. This doesn’t seem to be the case anymore. If you look through the portfolio, none of the products are particularly mind-blowing. Yes, they might be high-spec and feature the Apple brand, but there has been little innovation in the last few years to justify the increasing prices. Married with consumers becoming more cash conscious, Apple has seemingly pushed its customers over the breaking point of what they are willing to spend. That said, it isn’t just innovation which is to blame here, Apple is losing out to competitors in key markets. The Americas grew, though Europe, Japan and Greater China all declined. In the European and China markets, Chinese brands such as Huawei and One Plus has been gaining greater traction, with the price much more palatable for consumers. These are good devices which are offering just as technologically advanced features, suggesting Apple is losing the vice-like grip which it has on its customers. “And so, what we have done in January and in some locations and some products is essentially absorbed part or all of the foreign currency move as compared to last year and therefore get close or perhaps right on the local price from a year ago,” said Cook during the earnings call. How much of an impact the price reductions will have remains to be seen, but what is worth noting is that there was some good news from the call. iPhone revenues might have plummeted over the period, but all other categories grew, including the much-valued software and services unit. This is where Cook has been pinning his hopes, and there have been some gains. 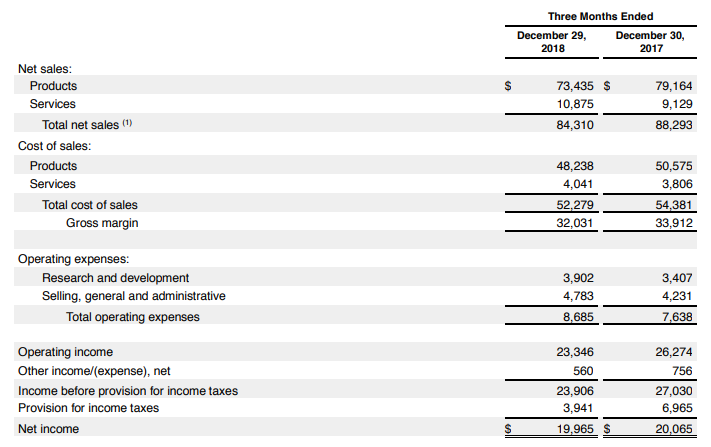 The software and services unit grew revenues by 19% year-on-year taking the total to $10.8 billion. Apple is attempting to evolve itself into a very different type of business, with recurring revenues as the ambition, though success has to be put into context. Yes, there have been gains, but it seems the dangers of the hardware world are being realised much faster than the benefits of software evolution. Apple has largely struggled in the world of software and services, perhaps because its traditional business model is not suitable. When you look at where Apple has been successful in software and services, iTunes, AppleCare and iOS for example, these are all areas which tie the customer into the Apple ecosystem. They are products which build on the Steve Jobs mantra of ‘closed is better’. However, Apple will have to embrace a new mentality is it wants to succeed in the new world. At CES, Apple captured most of the headlines without actually being there as it announced a content-based partnership with Samsung. Beginning in the Spring, new Samsung Smart TV models will offer iTunes Movies & TV Shows and Apple AirPlay 2 support for Apple customers. This is a good move from Apple, embracing the concepts of openness and collaboration which will be critical moving forwards. Another interesting development, which has remained unconfirmed, is the creation of a Netflix-like gaming platform. Apple would herd developers and gaming content behind a paywall which will offered as a bundle service for customers. The subscription service would take Apple into a potentially profitable segment, which is set to boom over the coming years. However, this cannot be tied exclusively to Apple products and would have to demonstrate openness. The last few months have shown that Apple is not immune to global trends and the need to evolve as a business is overdue. The reason companies like Google and Amazon never report revenue dips like this is they are constantly searching for the next idea. Apple might have been slow to react, but there is some progress being made. It just needs to be made quicker.